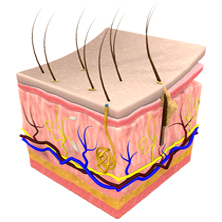 This system includes the skin, hair, sweat glands, and nails. It protects the body against loss of water, abrasion and infection. Common disorders include skin cancer, warts, acne, burns, eczema, vitiligo, and psoriasis.